A new project! Recently I got in hands a powersupplytransformer and supplychoke by Millerioux. These are old ones, came probably out of equipment of any kind... I got them from a friend of my, in trade for some capacitors. Both parties happy! The powertransformer has a relative low secondary highvoltage, not always suitable for tube-equipment, however, when I saw these, immediately an idea came up. A while ago, at a fleamarket I bought some small ouputtransformers with 5K primaries to 4, 8, 16 and 32ohms secondaries. They can handle about 50mA current and are U-bracket fitted. These in combination with the Millerioux transformers could make a perfect headphone amplifier with the 5842 as a voltage amplifier.. 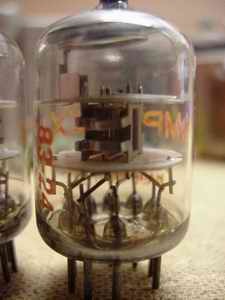 The secondaries of the powertransformers are 125, 135 or 145V at 60mA and 6.3V. The 5842 works fine at a voltage of about 150 to 180V at 25mA each. 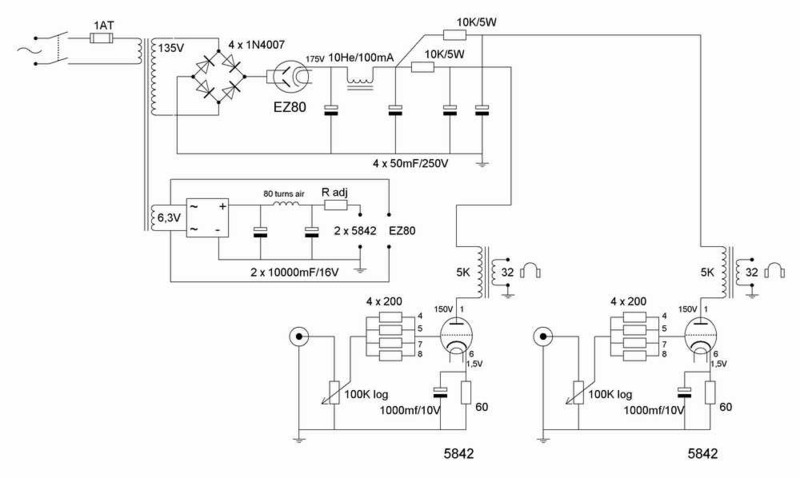 A good powersupply can perfectly be made in choosing the right voltage. The 5842 has a mu of 43 and, when calculated, will have an effective amplification of about 3,4 times when using the 32ohm tap... Normally headphones have a minimum sensitivity of 100dB, so the overall amplification should be sufficient. Rectification is done with diodes since the transformer lacks a high voltage centertap. I added an EZ80 right after the diodes to provide in a "slow turn-on". There are schematics which use a fullwave rectifying tube in combination with two diodes as a rectifier but I don't think that's the way to go: There will always be a different characteristic between diodes and a rectifying tube, so I chose this option... The electrolytics are from JJ which I became a couple of weeks ago from AE. The reviews of these elco's are positive (Angela), so I decided to give them a try. They sure are a lot cheaper than BlackGate! There is a double pi-filter, one with a common used choke and one with a resistor for each channel apart. 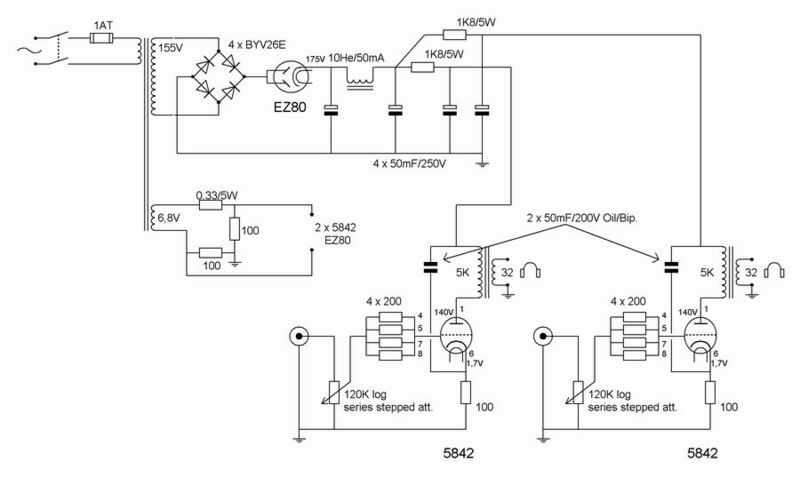 This way a clean powersupply and good channel separation is provided for the 5842. The resistor also can be used in fine-tuning the supply voltage. PS. I have to buy me headphones soon!!! Ready! The amp is playing and it sounds very good! It has been playing for quite a while now, so the break-in period has passed. I had to make a few changes to the original schematic which is corrected, by the way ( click here to see it). The output transformers are very sensitive in picking up hum, so I had to rebuild the amp for 3 times before that nasty 50hz hum was kept out... This lay-out was the most practible one, however the output transformers had to be shielded with mu-metal to effectively solve the hum problem... If you have to shield for 50hz (powertransformer), always use ferro-metals or mu-metal! Non-ferro metals, like copper, won't do the trick. 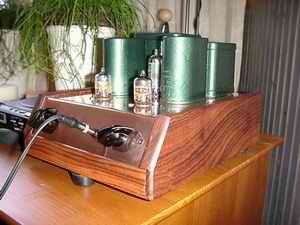 In the next pages you can see and read about building this amplifier. This really was a big surprise to me! The amplifier has a most detailed, warm and very good balanced sound. Voices are well placed (is that possible? ), and there are good dynamics. I have to admit that at first sight, the output transformers were not that convincing to me... If you see what core materials are used and how everything is wounded, well, it was not impressive at all. BUT! they do a very good job here! They have been taken from an old single ended amplifier (I don't know the brand). At the used 18mA they don't have to work, that's for sure, and that's audible. This adjustment is made through experimenting. I started out with 150ohms as a kathode resistor and slowly decreased to 60ohms keeping the B+ steady at app. 145V. At 100ohms and 18mA the 5842 really opens up, so I kept it that way. I think that this specific working point may be different for each amplifier and is really worth the effort in finding! You can easiliy use a pot here to determine this "sweet spot" and replace it afterwards by a fixed resistor. The second pi-filter has a 1K8 resistor. This resistor is responsible for a considerable voltage drop, though it is neccesary for good regulation... The GE paper-in-oil "shorts the signal path". In articles from Electraprint it is stated that the supply is not audible due to this capacitor; this is not true! Even a change in diodes, BYV26E for 1N4007, was audible! A nice amplifier, to say it myself. Interesting because it is made out of (mostly) flea-market materials. 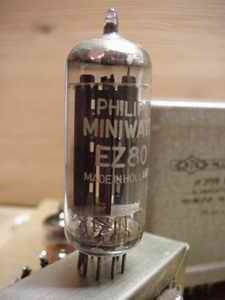 So for little money one can listen to expensive tube sound!